1. It is the start of the 'Golden Week', which means five out of 10 working days are holiday here! Like may pasok-walang pasok ang interval. It would have been nicer if I went home. I checked the flight and price as soon as I had known about this golden week earlier this year but Philippine and Korean airlines were a bit wiser in sucking up all my hard-earned money. It was triple the price! So I decided to just breeze through the holiday. 2. May 1, Labor Day. I think about my 'labor'. Lol. Work has been steady yet work never stops. I have never been as busy. Good thing my boss is on maternity leave so there is no unusual stress. Unusual because she has a way of really irritating me. I have not been to yoga in a while which may also mean it is just fine since I only do yoga if I cannot take her stupidity anymore. I look at the calendar and ponder where will I be same time, next year. The thought of only finishing my contract has been ever fresh. Sometimes, it excites me where to go next. Sometimes, it saddens me because I share our office's aspirations and values and there is so much work that needs to be done but you can only do so much. But I have come to a point where improving my career is non-negotiable and I should go where I need to take serious investment now if I really want to make a name for myself for the next few years. But who knows, I may be staying for a while. Always in some state of limbo for me. But Certainty comes with a resolve. And I must work for it. My resolve is to keep my options open. 3. Few weeks ago, few minutes from a quick nap, I logged into my email account and probably I was in my dreamy stage that I was beginning to forget the password of my mother email. I tried twice and I began to panic and yes, it dawned on me that I might be ending up with one of the worst days of my life - forgetting your passwords! So, there would go my bills, my insurance, my emails to e-waste. And yes, i was thinking of emailing Gmail already. It was a bit scary. Could it be a sign of ageing and the memory gap was real. I could not remember the password at all. To be fair, I have a difficult password since i mix up characters (for security purposes). So, what I did was to focus on the keyboard and tried sensing my fingers where keys it would lead me, this could minimize the errors. I know I must have mixed up some characters. After two errors, I was successful! And to make sure, it won't happen again. I quickly wrote it down so I won't forget. So the lessons are try to have a simple password and write down all your passwords. So this golden week, I am making an effort to list down all my life's passwords and pins before my memory fails me. 4. It is National Children's Day today (May 5). Holiday. Spending me time in our nearest neighborhood Coffee Bean and Tea Leaf (with all the thousand concept coffee shops abound, why do i end up most in this rather 'bagong bagong' CBTL. To be fair, sometimes, it is not really the coffee but the location. It is because I will go to Daiso (few blocks away) for some therapeutic window shopping). Today I have never felt so adult today probably because it's Children's Day. 5. A good news back home reached me. A dear friend is already a lawyer! I remember she was an intern in our former office. Eventually she became my officemate. There was just so much promise on this woman when I first saw her. As I got to know her more, I learned that she juggled life's uncertainties to make ends meet. But she persevered in every process of struggle. And she always ends up winning. One of my ever realiable go-to girl whenever I need a reality check. Anyhows, you see, dreams do come true back home. If you can make it there, I believe you can make it anywhere. 6. It was a short business trip to Istanbul and I made sure I got to see at least the major tourist spots in this postcard perfect old city. As soon as I arrived, despite the long travel and the jetlag, I braved the city's streets and went to major tourist areas. The city is filled with mosques, and mosques, and mosques. 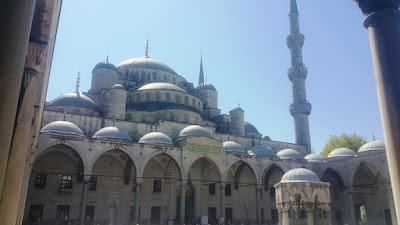 Yung mga 14th century mosques level na well preserved, yung mga level na madidiscover pa lang ni Magellan ang Pilipinas pero may ganito ng mosque (photo above: The Blue Mosque) dito. Well I promise to return. Istanbul was so overwhelming me, so exotic. There is a bit of adrenaline, some danger too. Yes, given its strategic location, it is an attractive target for chaos. Anyhows, everytime I see a grand mosque like this one, I tell myself such a wonder. But like any other mosque, its interior is just a hollow, with walls pattern painted. Unlike Catholic Church with all the ornaments, its interior is overwhelmingly plain. Of course, Islam rejects idols, human faces. On the contrary, it believes in angels. That is why if you happen to be in an Islamic Museum, it is all about patterns of this and that! which I find a bit boring. Perhaps to prevent any distraction to your faith, they set up their church with abound plainness. So inside the Blue mosque, I also pray. Praying for my faith to be always unyielding. And with no distractions, I feel at peace.